The Birth House has obstetric TENS units available for hire. Please call us on 0412 763 033 for information about hiring a FreeMOM TENS Labour Pain Management System. FreeMOM is a Transcutaneous Electrical Nerve Stimulation (T.E.N.S) device which has been specifically designed to assist in the relief of pain during labour, after-birth pain, assist with sleeping after the delivery and lower back pain. Is FreeMOM easy to use? Very! 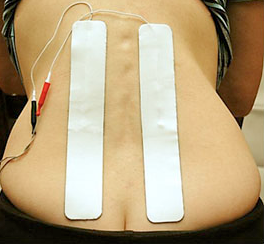 The electrodes are applied to the lower back (see picture below), when labour first commences. The expectant mother sets the FreeMOM TENS to a comfortable sensation level while pressing on the ‘Booster Button’. Once set, at every contraction the expectant mother simply presses the ‘Booster Button’ and holds it down until the contraction ceases. 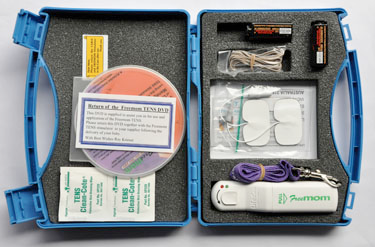 A full instructional DVD is included with the FreeMOM TENS unit. We can also arrange an appointment with one of our qualified health professionals for a more detailed demonstration. FreeMOM initiates the action of the body’s own natural pain –relieving mechanisms. FreeMOM is used to provide a background level of pain relief to which any other form of analgesia may be added if required. FreeMOM may be used whilst still at home, or from the time you arrive at the hospital. FreeMOM may shorten the 1st stage of labour, but otherwise does not alter the natural course of labour. FreeMOM allows the mother to be fully mobile and “in control” during her labour, unlike other methods of pain relief. FreeMOM can be easily interrupted or discontinued at any time during the labour. (It may need to be disconnected during foetal monitoring). Benefits of greater comfort during early stages of labour are carried right throughout the birth process. FreeMOM can also be used for after-birth pain, restless leg syndrome and other pain e.g. lower back pain and shoulder pain. FreeMOM is the smallest, easiest to handle unit. FreeMOM is very simple to use and may be placed around the neck for freedom of movement. Two long electrodes cover the spinal nerves to the uterus and cervix resulting in greater area coverage and less wires to get in the way or tangled. Menu driven instructional DVD with each unit. Used in hospitals throughout Australia and by mothers world-wide. How much is the FreeMOM to hire? Please call us on 0412 763 033 for information about hiring a FreeMOM TENS Labour Pain Management System.